Donation processing for the donate button is done through Network For Good. A benefit for nonprofits with a Bronze Seal of Transparency or higher, adding a Donate Button to your profile makes it easy for donors to give to your organization while they’re on your Nonprofit Profile. Click the Confirm & Publish section, located beneath your organization’s name. Check off the three boxes at the top of the web page. Locate the Donate Button section and toggle “On” the option. Updates will appear on your GuideStar Nonprofit Profile within 24 hours after publishing. Not sure how to earn a Bronze Seal of Transparency? Read our step-by-step guide. 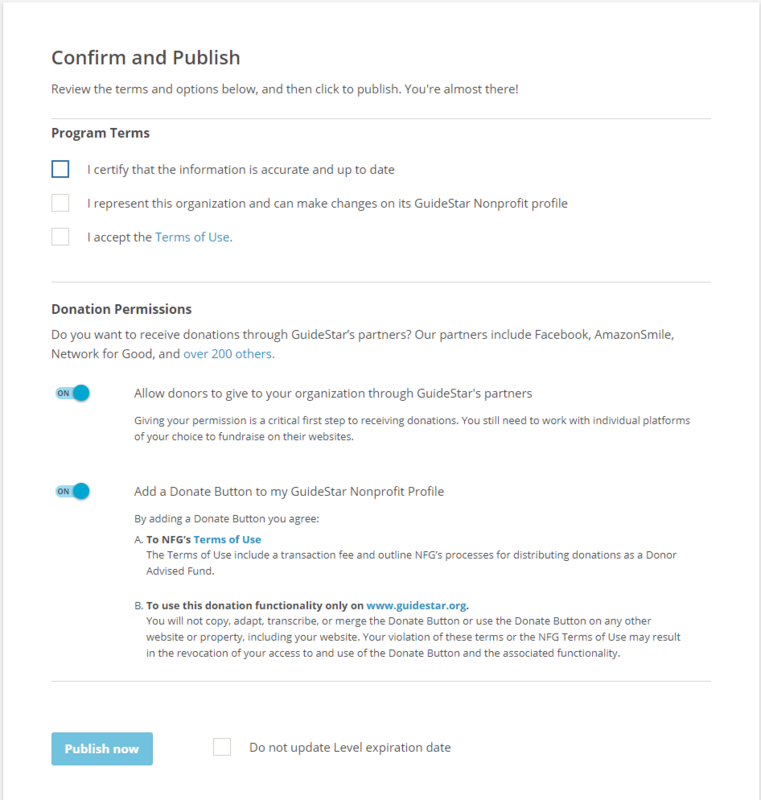 GuideStar does not manage the online donation process, we are partnered with Network for Good. You can contact Network for Good directly for donation information at help@networkforgood.com or by phone at 888-284-7978. Is there a processing fee for the Donate Button? Yes, we have partnered with Network for Good to provide the Donate Button. Network for Good retains 4.75% of each donation to cover processing costs. This is lower than our previous donation processor, who retained 5.99%. GuideStar waives any additional fees and does not take a percentage per donation. How can I view Donations made to my Organization?